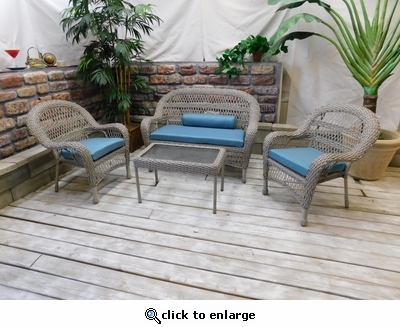 Enjoy a quiet interlude or a fabulous gathering with this breezy, open set. The airy lattice design encourages refreshing air flow. Extremely comfortable woven "All Weather" Polyresin over a over a rust-proof, powder-coated steel frame. Includes cushions in your choice of indoor/outdoor fabrics. Sunbrella fabrics available at an additional cost. Available in Driftwood Gray finish. Set includes Loveseat, 2 Chairs, & Coffee Table with glass.